Recently I was asked to submit video of my run form for analysis which prompted me to revisit an online source that was offered to me by my old coach. There are various services to critique running dynamics, I visited Steve Gonser of Run Smart almost 5 years ago and if nothing else have have transitioned from heal striking to mid foot landing ever since. At the Boston Marathon on Monday I witnessed the most elite runners in the world cruising sub 5 minute miles almost effortlessly, whereas some amateurs raced heroically and in despair to catch a little camera time, including a 31 year old father who killed himself for a 4:38 first mile only to run a 3:04 marathon (check out 06:10 in the link). Afterward I took a little time to look at my gate next to one of the top 5 finishers to compare stride angle. 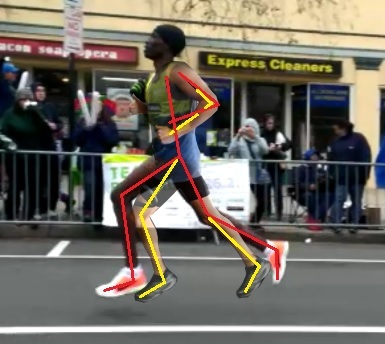 Even though the side profile image only shows me running a 6 minute mile compared to the likely 5 minute of this elite runner the 20 degree difference in stride angle equates to a 40% difference in stride length according to the Somax Performance Institute. This means over the course of a marathon if we had the same cadence rate I would be forced to take near 5000 more steps in order to keep pace. If you watch the video and take the time to crunch the numbers you can see how impactful small changes in angles relates to efficiencies in form which correspond to significant time savings. My question is how can these changes be made??…seriously?? I’ve been running competitively for 10 years now and to use swimming as a comparison it has taken close observation and critique on a daily basis for years to improve my technique. I would love to hear from serious runners who have changed their form to improve performance without injury or any other negative impacts. This year has been the year for calf injuries, whether because I’m aging up or simply because I’m more aware having had one myself. I’m very interested in what’s going on out there and where the curve lies on performance improvements. Perhaps I’m lazy, or maybe it’s a very difficult thing to change, if even wise to toy with at all. All I know is that in addition to wanting to get faster and be more efficient I’ve put somewhere in the realm of 20,000 miles on these legs since college in running alone and if I want to keep the machine running smoothly it’s good to ask the right questions before things break down. Interesting – 80 degrees, wow! I wonder if you increased your hip/hamstring/IT flexibility significantly to make that angle easier for the back side of your legs and did high knee exercises to increase strength lifting on the front of your legs in your hip flexors (as intervals or yoga/ballet poses that lift your legs forward and up) if that would help – do you hold long stretches/do yoga regularly?